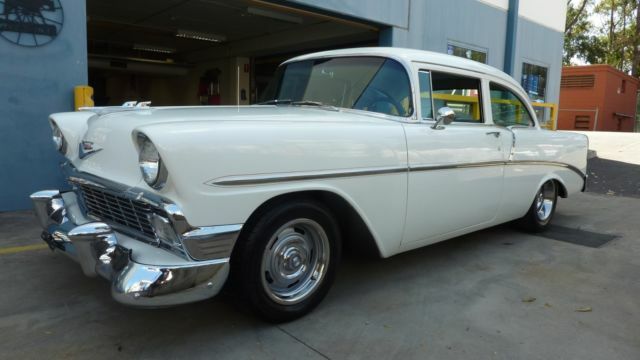 1956 Chevrolet 210 Post, 355 V8 - 375HP crate motor (2000 miles old) 700R4 transmission with Lokar shifter, Holley carb, polished manifold, Polished aluminium radiator, Air con, power steering, boosted disc brakes, excellent glass, 15" rally wheels, White with matching black and white trim. OPEN ONLY SATURDAYS 10am TO 4pm. While we are happy to show our customers the casting numbers , stamping on the motor and V.I.N numbers on the car , we CANNOT guarantee that the motor is in fact the original. There is always the possibility of re-stamped motors , and as technology advances there will be even more. Any representations made by us are "to the best of knowledge". The entire risk as to the originality of the vehicle is with you , The Buyer. We CANNOT guarantee the originality of these vehicles , including but not limited to : the engine , the transmission , "matching numbers" , color change , the frame , the documentation , etc. The mileage is represented to be , "to the best of knowledge" , but not guaranteed. Price includes 10% GST and we will supply a Tax Invoice. All successful winning bidders will need to sign a contract for sale of a used motor vehicle subject to the terms of condtions of the motor car traders act (VIC) 1986. The successful "winning" bidder must telephone us within 24 hours after the auction has ended to verify purchase and make arrangements to complete the transaction. Full payment must be received within 7 business days of the end of auction. Payment must be either by bank cheque, cash (In-Person) or EFT funds. If funds are not received, and an alternate arrangement has not been made, the vehicle can and will be made available to other potential buyers on a first-come, first-serve basis. The parties agree that this contract shall be construed under the substantive laws of the Motor car traders act (VIC) 1986 , that the state courts of Victoria shall have exclusive jurisdiction over any action brought to enforce the terms of this contract or over any action arising out of the underlying transaction. We have disclosed as much information as possible about this vehicle and aim to only carry quality vehicles. However, we recommend that all buyers conduct an inspection either in person or through a qualified professional third party inspector. Prior to delivery, if such inspection reveals a substantial discrepancy between the information contained in the listing and the actual vehicle, we will correct the problem at no charge or work out a compromise. All vehicles are sold As Is, with no warranties expressed or implied, by seller. Vehicles come with books and/or manuals only if pictured in the included photos or if stated in the ad. As with any used vehicle, minor signs of wear may become more obvious under close inspection, such as small chips or nicks, light scratches or minor abrasions, wheel scuffs, and other indications of normal wear and tear. We will not and cannot be held liable or responsible for these issues. Non-paying bidders, unqualified bidding, bid shielding, auction interference or any type of harassment, will be dealt with according to eBay Rules, local law, and may include, but are not limited to, legal action and applicable fees, lose of deposit or any other necessary costs. PLACING A BID ON THIS AUCTION, CONSTITUTES ACCEPTANCE OF THESE TERMS AND CONDITIONS AND ACKNOWLEDGMENT THAT YOU HAVE READ AND UNDERSTAND ALL THE INFORMATION PRESENTED. © Classic Custom Imports Pvt Ltd . 2014, All Rights Reserved.